Black is back! The matte black fixtures trend is suddenly everywhere! There are numerous ways you can incorporate this trend into your master bathroom. 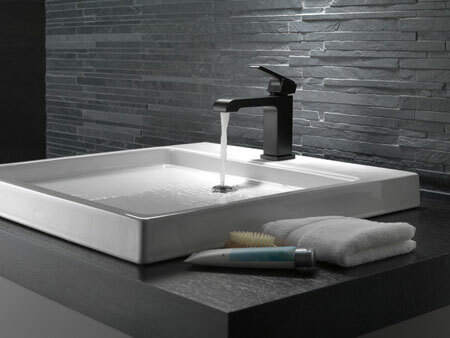 Simply adding a matte black faucet or a few black bathroom accessories can transform any bathroom into a modern oasis. Here are our top 10 ways to incorporate this eye catching color into your dream black bathroom! We have classified each of these ideas based on the difficulty level of the installation. Replacing the shower head in the master bathroom is the first thing I do when I move into a new home. 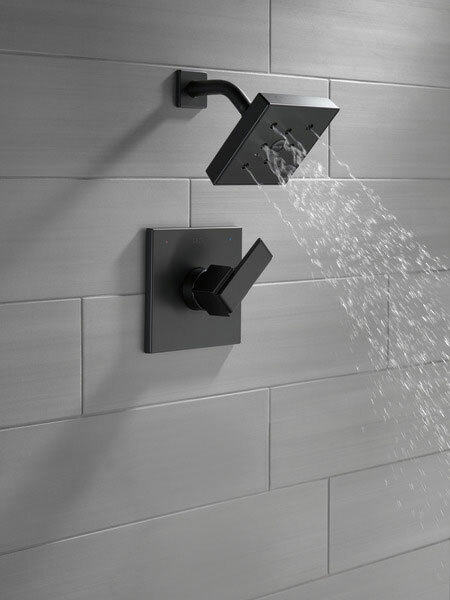 Adding a matte black shower head is a great way to modernize your existing shower faucet. 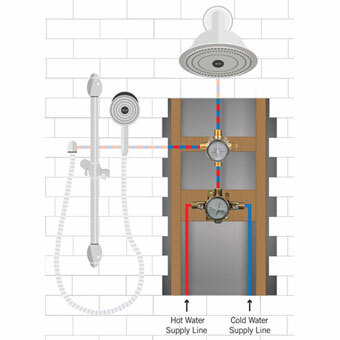 Changing the showerhead is as simple as unscrewing the old and screwing on the new. It's one of the easiest changes you can make! 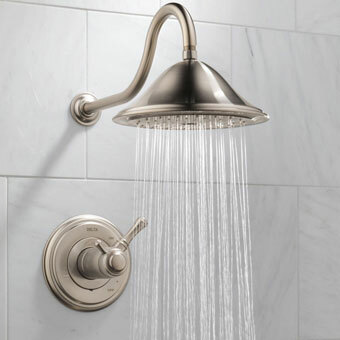 However switching the showerhead alone is not going to truly transform the space. To really make an impact on your bathroom design, I suggest switching to a complete Delta black finish shower faucet. 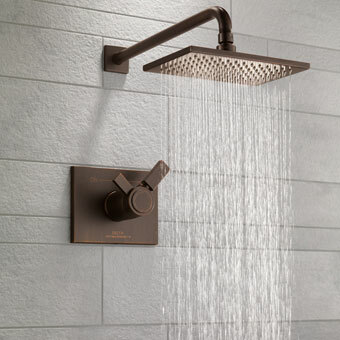 A shower fixture like this will change the way you enjoy taking showers forever. 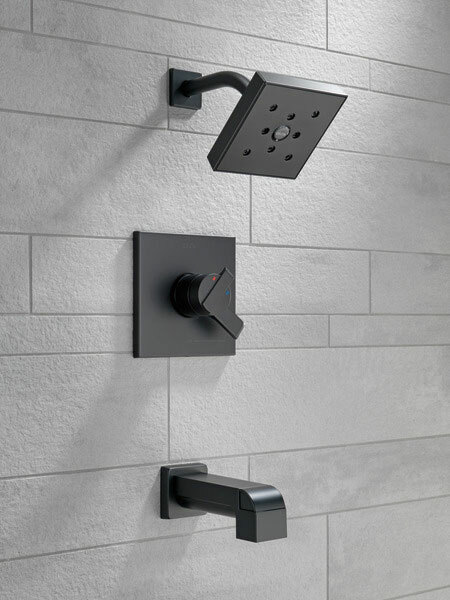 These Delta matte black finish showers have a dual handle control. One control handle allows you to set the water flow volume, and the other control allows you to set your preferred temperature. Plus they feature Delta’s patented H2Okinectic shower head which gives you the feeling of more water while still conserving it. Switching to a black shower faucet system like this is a great way to add value to your home and improve your master bathroom! If you already have a Delta shower fixture you may be able to make the change yourself by replacing the trim kit only. However, I recommend consulting a plumbing professional if any of the valves or other piping needs to be replaced as mistakes during installation can be costly. One of the easiest and quickest ways to transform a bathroom is by changing the shower curtain. Some people even change theirs seasonally! Most shower curtains are attached with simple rings that easily open, allowing you to change the curtain in just a few minutes. Black bathroom accessories like a shower curtain are timeless and add some uniqueness to any space. A striped black and white curtain helps create a modern feel while adding effortless style to your bathroom. 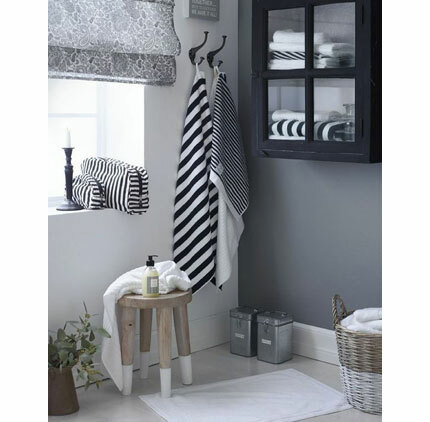 See this black and white striped shower curtain on Pinterest! 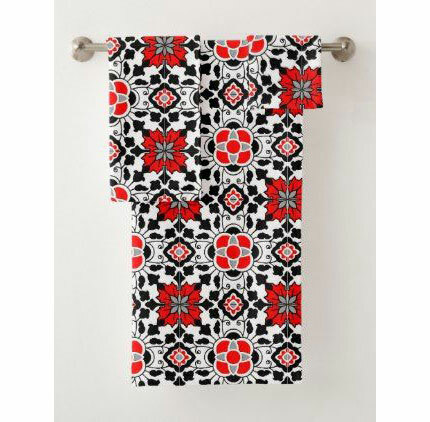 Get a Black Shower Curtain with a Splash of Color! I love darker spaces, but even a large bathroom can start to feel tight if there are too many dark fixtures. One of the best ways to incorporate the matte black trend into your space without creating a black hole in your bathroom is by adding a splash of color with your shower curtain! One of my favorite complementing colors when decorating with black is green. Adding a touch of green, or any color you prefer, to your matte black bathroom fixtures will really brighten up the space while still keeping the modern look. 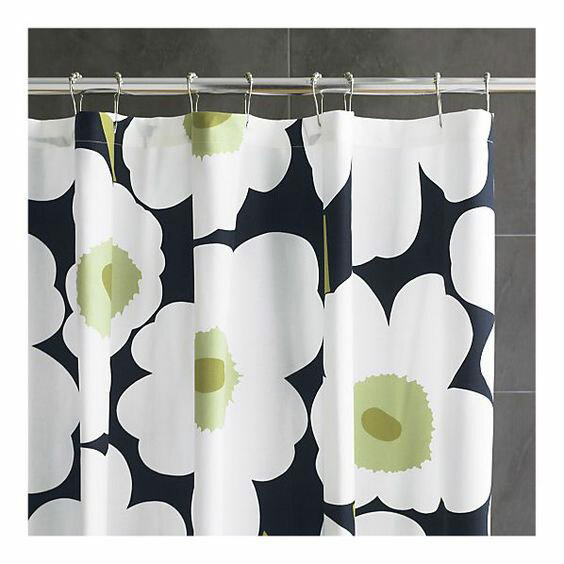 See this black, white, and green shower curtain on Pinterest! This is something you definitely do not see every day! Adding black bathroom fixtures like this black wall mounted double sink will truly make your space unique. A black sink or black countertop will look great with a champagne bronze finish or stainless steel finish faucet and drain. I love this large, black, dual faucet sink because it is a functional choice for a small space where a bulky vanity may not be an option. 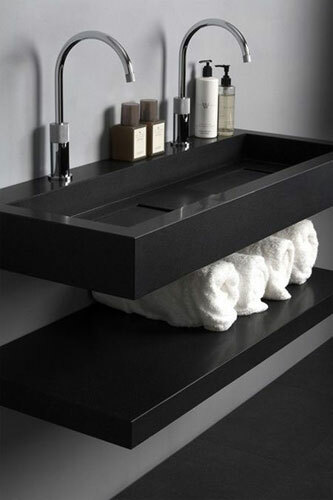 The matching black bathroom shelf below is a neat and functional feature. There are all sorts of interesting bathroom vanity options out there. Don't limit your self to just the standard styles. Unique fixtures like this will really make your room exciting! A black bathroom sink looks great with nearly any existing vanity or bathroom cabinet, but I personally love the contrast of a black sink or countertop with a white vanity. If you choose to go with a lighter color vanity, a black countertop will look super stylish. 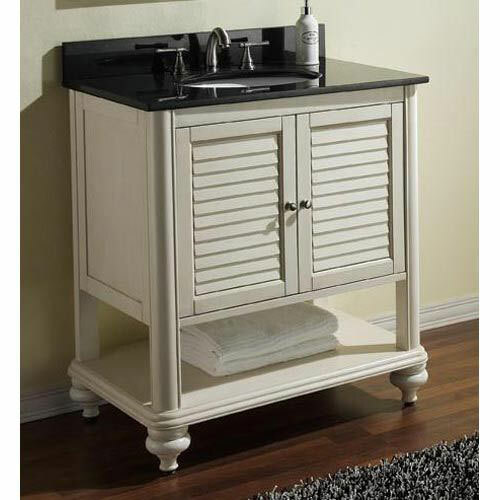 Adding black handles or knobs to your existing bathroom vanity is another inexpensive way to tie everything together. Depending on the type, installing a new sink or countertop could get a little tricky. I suggest consulting a professional if you have no experience with installing fixtures like this. 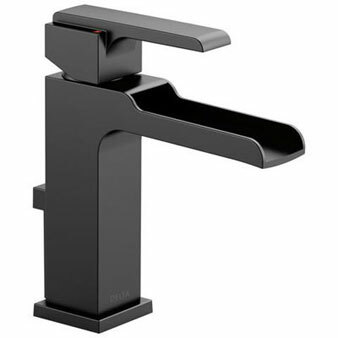 It does not get much more modern than a square matte black sink faucet. 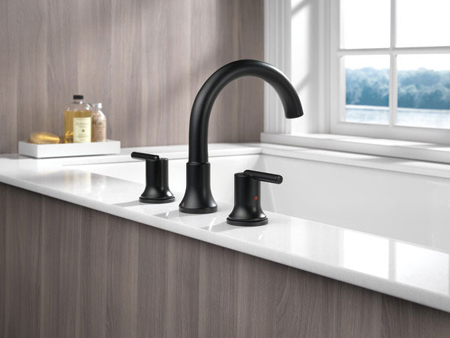 A single-hole black finish faucet like this looks amazing when paired with a modern design white sink. 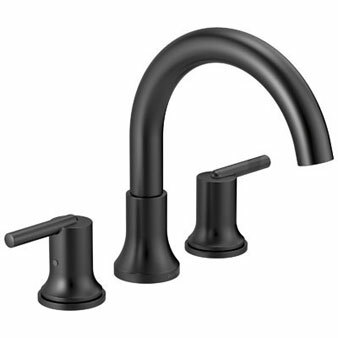 This simple faucet goes well with virtually any matte black bathroom accessories, and is Delta WaterSense certified so it meets the EPA’s water conserving guidelines! 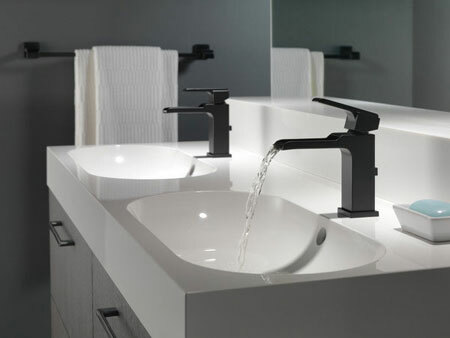 The coolest thing about this modern black bathroom sink faucet is that is comes in both a standard spout style and also an exciting channel spout design. The channel spout is definitely a unique piece for a modern bathroom design. It's fun to watch the water run through the little aqueduct! Most bathroom sink faucets are easy projects to handle yourself. If you are moving from a multiple hole faucet to a single hole faucet, you may need to consult a professional to be sure you have all the correct parts for installation. Who has not dreamt of having a giant, clawfoot, free standing tub in their master bathroom? This may be one of the coolest black bathroom fixtures I have ever seen! A free standing tub can be a hefty investment when remodeling your bathroom, but it is definitely something you will not regret. Tubs like this are available in the traditional heavy cast iron as well as a lighter acrylic option. 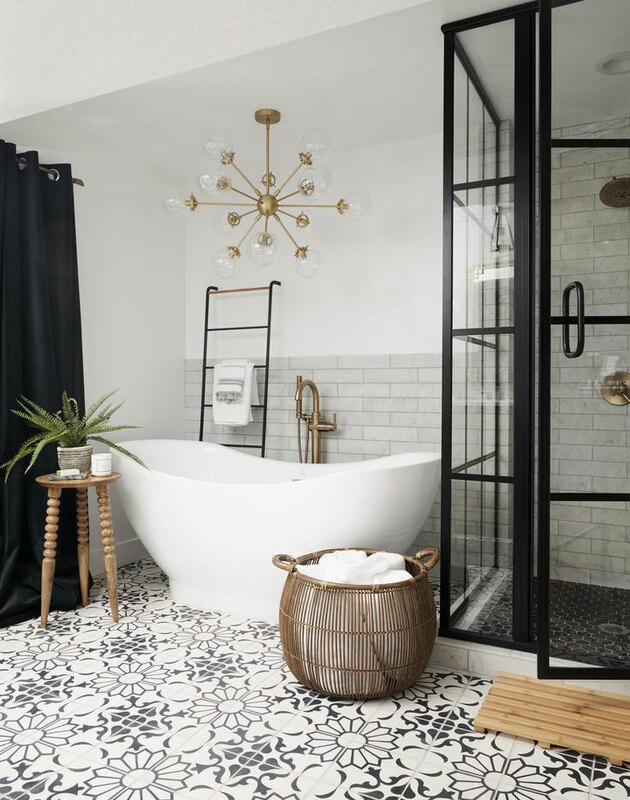 Cast iron free standing tubs last for generations, and a black bathroom fixture like this one will definitely complement any future bathroom décor ideas. If you choose to go with a black free standing tub like the one pictured, I suggest choosing fixtures in a complementary finish. I love the contrast of the satin nickel feet and tub filler in this contemporary bathroom design. High contrast finishes like this add dimension to a small bathroom without compromising space. When shopping for a freestanding tub, you may not be able to find one that comes in black like the image above. However, many freestanding clawfoot tubs are designed so that the outside can be painted any color you like. You should consult the manufacturer of your tub as to the best type of paint to use. 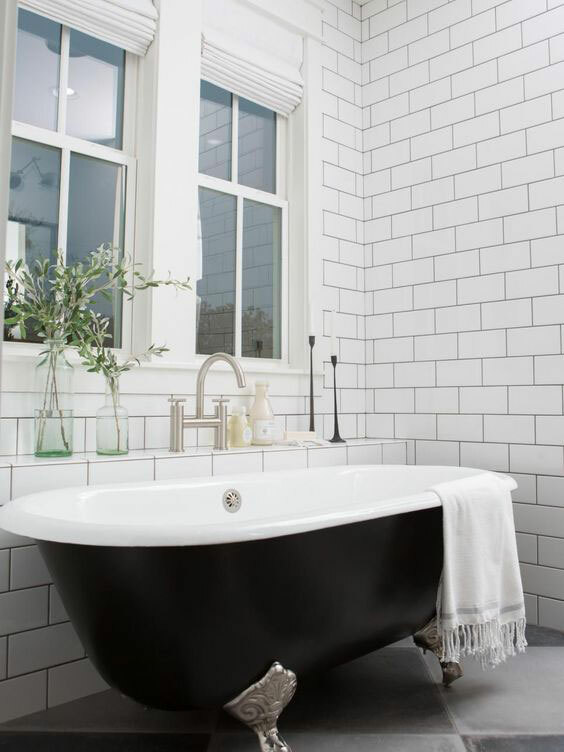 It may be possible to add this trendy black color to your existing tub by painting the tub yourself! Installing a freestanding clawfoot tub is a pretty large task. The average cast iron tub like the one pictured weighs between 200 to 400 pounds, so you will definitely need some helpers. Not only is a cast iron tub heavy to move into place, but you will also need to install the drain, supply lines, and clawfoot tub hardware. I suggest getting a professional for this project. 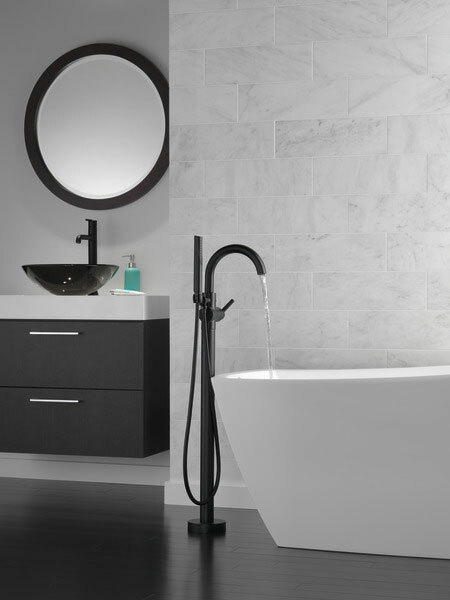 See this black finish freestanding tub on Pinterest! A freestanding floor mounted faucet would work great with either a claw foot tub (like the one shown before) or with a modern pedestal free standing like the one shown here. The contrast between a modern white tub and a freestanding matte black tub filler looks amazing! I prefer the floor mounted tub filler design because of its elegant beauty. Notice also the black finish glass vessel sink and matte black vessel sink faucet in the background. Pairing these dark fixtures with light colored marble walls creates a dreamy, modern, minimalist space! Black finish free standing tub fillers connect to the water supply through the floor, so you will need to make sure your home’s plumbing will allow for this, if you choose to go this route. I highly suggest having a professional install a free standing tub filler like this one. If you don’t want a wobbly faucet, it’s best to go with a well known brand like Delta. This is my absolute favorite floor mounted matte black tub filler! If you have a more standard bathtub in your home there are plenty of neat matte black finish tub fixtures that will work for your needs as well! 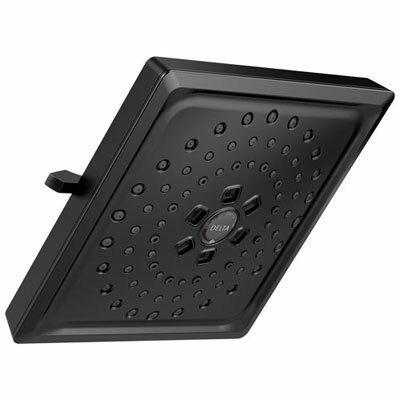 My favorite Delta Trinsic Collection also has a black finish deck mount tub filler option. 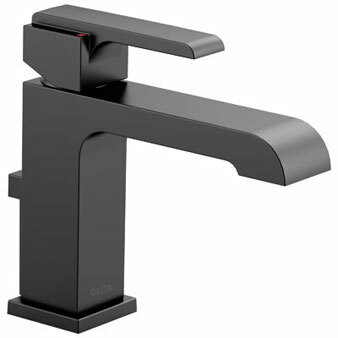 Whatever style you choose, a black tub faucet is very eye catching and unique. Installing either a freestanding tub faucet or a deck mount roman tub filler faucet is not really a job you would want to do yourself. Both of these tub fillers require a compatible rough-in valve to be installed underneath your floor/deck. If you are unfamiliar with installing rough-in valves you’d probably want to leave this job to a professional. Bathroom lighting can be tricky. 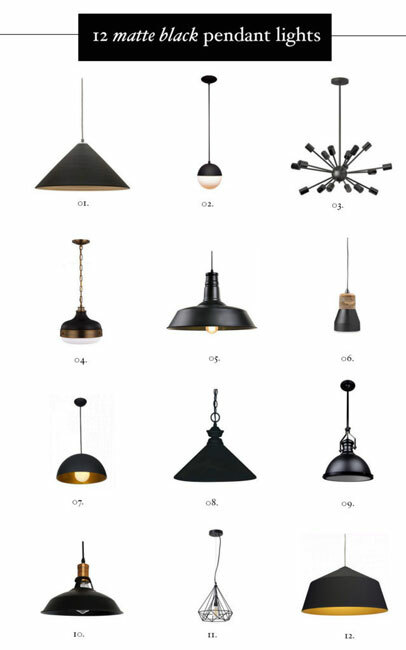 Over-head lighting may not always be the best choice for functionality, but a pendant light is a great and unique addition to any room! Imagine soaking in your black claw foot tub with the perfect reading light just above you. A pendant light with a soft bulb would be great! You could even add some bath tub accessories such as a black pillow and tray to tie the space together. If your bathroom already has wiring for a ceiling light, you may be able to install a pendant light yourself. If you are adding a light from scratch, I suggest getting assistance from a professional if you have no electrical experience. See more like this on theeffortlesschic.com! The most common bathroom light fixture is a vanity light. How often have you moved into a new house to find an outdated brass vanity light hanging over your bathroom mirror? Changing to a matte black light fixture is easy, inexpensive in most cases, and will instantly update your space. 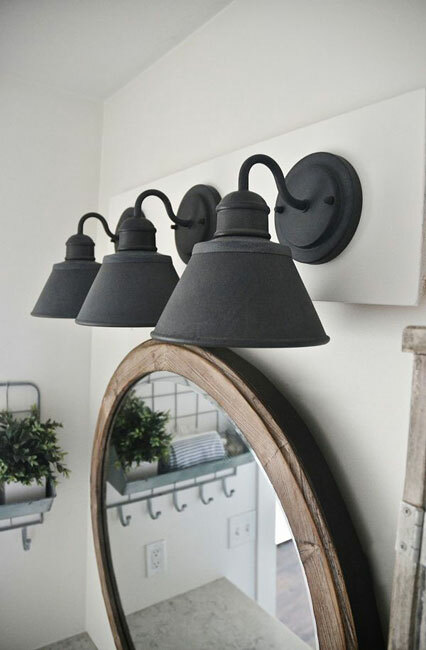 The light fixture in this picture could actually be a DIY project! Choosing your own black light fixture like this is an awesome way to add your own creative touch to your new bathroom, while sticking to a modern and minimalist design. Learn more about this vanity light on lizmarieblog.com! Tiling your bathroom floor is never a bad idea, especially if you choose a unique design like this! There are so many modern versions of the traditional black and white square floor tiles. Adding black to your floor is a great way to tie the black bathroom fixtures together. Many homes, like mine, were built in a time where brightly colored bathroom tile was the trend. I am a huge fan of the retro look, but sometimes it can be tricky to find colors that work well with the existing mustard yellow tiled walls and floor of my master bathroom. If you are in a similar predicament, rather than spending thousands of dollars ripping out the old tile and replacing it, try adding some black bathroom accessories to get a more modern look at half the price! I personally love how the designer of this bathroom incorporated black into the stall shower frame and ladder accessory! This is also a really great example of how you can use multiple finishes in the same space for a more eclectic style. Tiling any room can be a big project. I suggest hiring a professional if you have no previous experience. See more pictures of this amazing design on andreawestdesign.com! 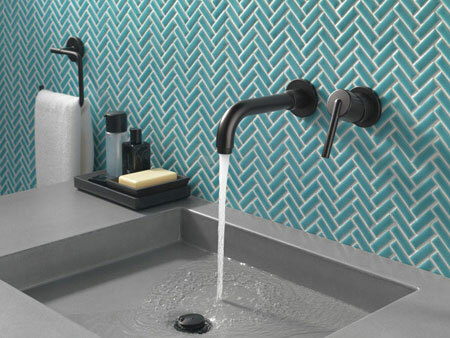 I love this sink and faucet combo with the turquoise patterned tiled walls! Here the designer added a matte black towel ring and soap dish to tie in with the matte black wall mount sink faucet for a very clean and modern look. The pop of color provided by the tiles is complemented by the muted black fixtures nicely. Adding bathroom accessory fixtures like a towel ring or toilet paper holder is a super easy DIY project. Other small touches like black outlet covers and maybe even a black door knob are things you can do yourself to complete the design and give the room a more upscale feel. Linens are a necessity in any bathroom, why not make them fun? By incorporating black into your bath towels and bathroom rugs, you add an extra modern feel to the space. If you are on a budget but still want to add a unique flair to your bathroom, changing the linens is an inexpensive way to add black to your space for a more modern look. Notice also the black finish robe hooks and cabinet on the wall. These are a simple and functional addition to any room! I love to fit black into a home design wherever I can, but my husband prefers brighter colors in our common spaces. One way we compromise is by choosing linens that allow us to express both of our styles! Adding linens that include both black and another accent color will pop in your new modern bathroom while also keeping the room light and fun. This bathroom towel incorporates a very brilliant red. Paired with the black and white pattern, the effect is amazing! Depending on the space allowance in your bathroom, adding some themed wall hangings could really tie the color palette together! Black bathroom décor ideas like this are a fun way to incorporate this unique color into your design. 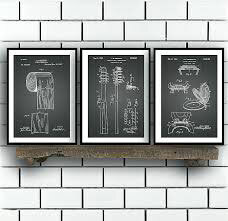 If you have tiled white walls the addition of some black chalk boards looks really cool! Themed artwork is also a great conversation piece. If you’ve chosen to really embrace the black bathroom theme, adding some color is a great way to keep the space bright and open. I absolutely love this color combination! The black wall paper adds an elegant flair to a retro design! This is an amazing example of how you can work with your existing fixtures. 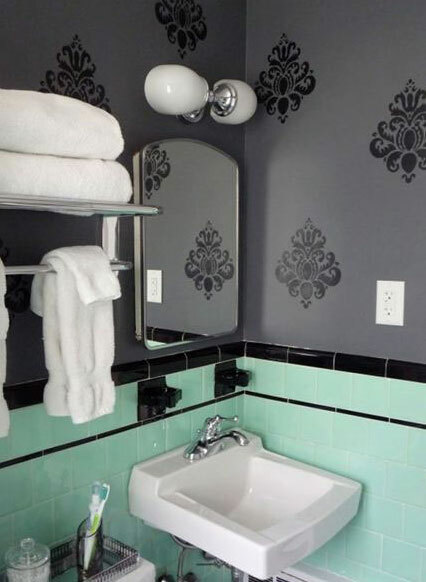 This vintage design incorporates black tile, retro green tile, and bathroom accessory fixtures like a chrome finished faucet and a black toothbrush holder. Everything looks neat and purposeful and is tied together by the stylish black wallpaper. Some people might say wallpaper is not a DIY project but we’ll leave that one up to you! Matte black is one of my favorite new color trends in designer bathroom fixtures! Black offers a clean look which works great in a modern or minimalist designs. Incorporating black bathroom fixtures throughout your master bathroom décor will make your space look fresh and contemporary. Black bathroom fixtures also look great next to a pop of any of your favorite bright colors. When paired with black, other bright colors really get their chance to stand out! Try some of these matte black bathroom décor ideas in your home and share your pics in the comments. For more color themed design ideas, subscribe to the FaucetList.com newsletter!